Yes. Three-hundred horsepower. 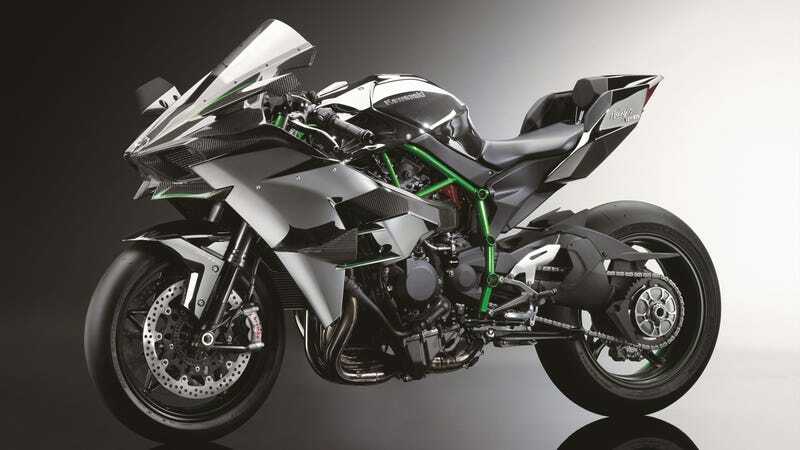 That's what Kawasaki's absolutely deranged Ninja H2R is putting out. They say it was made "to offer the kind of acceleration most riders had never experienced." Apparently you have to qualify that statement with "most" because of the handful of riders that also pilot SR-71 Blackbirds. Seriously, there's no way to overstate this kind of power. The closest thing on two wheels is BMW's new S1000RR, which manages with a measly 199 hp. That makes the H2R the most powerful motorcycle ever produced. Obviously, it's not for the street. There are no signals, no mirrors, and no headlight. Seventeen-inch racing slicks are mounted at each end and that exhaust couldn't pass a dB test at idle. The engine is a 998cc inline four with a centrifugal supercharger mounted on top. Kawasaki isn't giving up any engineering details, but it's enlisted the company's entire empire – from its turbine division to its aerospace company – to make this thing happen. We've even seen some patents that indicate that the supercharger could even have its own two-speed transmission to make it, y'know, actually rideable. The trellis frame – a first for Kawasaki – is there to both harness the power and balance flex under load, and rather than going with a long wheelbase for straight-line stability, they've opted for sport bike geometry and some aero bits to keep things stable at speed. That also means it will turn. Right now, Kawasaki isn't saying a damn thing performance numbers. Or traction control. Or ABS. Or a standard life insurance plan. But 200 mph isn't just in the cards – it's guaranteed. A street version is coming later this year, the H2, but in the meantime, make sure your trust is written and you've checked the organ donation box on your license.